www.sausagemaking.org • View topic - Christmas Ham ? Hi everybody, I'm contemplating curing a full ham for Christmas. Is it safer to remove the thigh bone or leave it in. I would like to make up a brine cure to submerge the ham in, however, I'm getting a bit confused looking for ideas. I have seen Oddleys 2:1 brine ratio, regarding the weight of the meat/weight of brine and also Wheels dry cure calculator. Does the length of time stipulated take into consideration how thick the piece of meat is. Surely a flat piece of belly would cure before a thick piece of leg meat of a similar/equal weight ? Also in most books I've read, they recommend a dry rub for a few days prior to immersion. Is this necessary or should it go straight into the tub ? I don't have access to a pickle pump. Do not use my dry cure calculator for your first Christmas ham! 'In fact, why would anyone risk doing something that they've never done before for an important event? If you want to do your first ham, a combination cure, or one of my injected cures are a safe option. OK, they're a little bit short of a dry cure or full brine cure - but you don't want to look a plonker come Christmas tea time! An equilibrium brine cure probably gives a better product, but you're pushing it time-wise for a decent sized piece of meat with the system I use. Other members use a different method and may be able to help. The main problem with an immersion cure on a large piece of meat is the time it takes for the cure and salt to penetrate. The same is true for dry curing. The longer it takes to cure the ham, the more that can (and will) go wrong. I favor a combination of injection and dry curing. The injection starts the curing immediately in the interior and the dry curing protects the exposed surface. Give yourself an early Christmas present and get a syringe pump, Santa wants you to have it. I do combination, injection and dry cure. I leave the bones intact. I inject and apply dry cure, a week later I re-apply salt to any exposed bone. You'll find more choice in injectors if you search for "marinade injectors"! Thanks for that Phil, ordering it as we speak. Just noticed an advert on telly saying that boneless pork leg in Tesco is £3.49 a kilo, so might pick one up for around a tenner to experiment with. Right then - pump is on order and pork is in the fridge awaiting its arrival. I picked up a piece of boneless leg pork for £3.00 a kg from Asda (Walmart) and it weighs 2.596 kg, so is plenty for my experiment into the 'dark arts' of ham curing I've decided to use an injection method incorporated with a dry rub of the remaining cure. 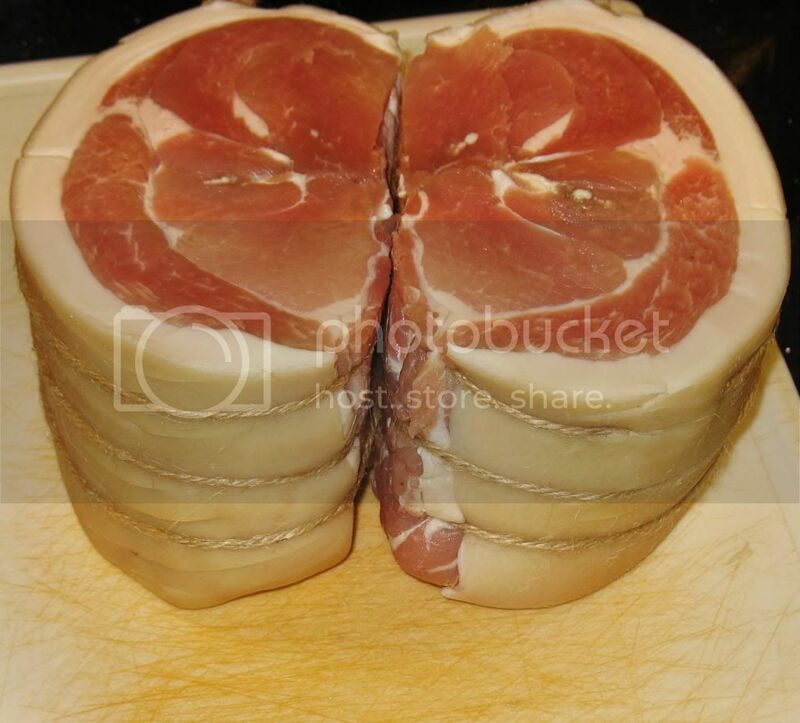 I'm looking to copy a shop bought 'Balt'am' (boiled ham) but may add a few spices to the cooking liquer or take the ham out before its completely cooked, remove the skin and create a spiced glaze with honey/mustard and a few cloves before giving it a quick blast in a hot oven. I've a few days before the injector arrives and the meat has a good shelf life seeing as its vacuum packed, so I'm in no hurry to commence. I'm now busy searching the site and individual's blogs for an appropriate curing recipe, but in the mean time if anyone wants to throw one into the hat for my perusal, I'll be eternally grateful ! Have a look at FAQ,s Brine cured meats for beginners.I think you get good results boiling up you herbs and spices and injecting them. 14 days will be fine you would probably get away with a week but you cant overcure.let us know how you get on. I wanted to try some for cooking, so as the joint weighed 2.7kg, I cut it in half. I then gently poached the ham in a stock flavoured with onion, celery and carrot with a few peppercorns. It tasted fine, but had a certain background flavour that I found a bit different. I think this is from the herbs/spices in the brine, so will omit them next time until I'm sure about what I'm doing and just use them in the cooking liquor. The ham was designed to be a 'boiled ham' type and was used for sandwiches, either flavoured with English mustard ( the type that delays for half a second, then burns the inside of your nose), or a fruity chutney I made the other week from a batch of windfall apples. It could have been taken a step further and 'glazed' in the oven to flavour all that fat, but I was happy with it as it was.